"Most advanced alien species will likely have developed forms of communication completely unrecognizable to us." Sa zo inel semï zaz kie rile uniefat ylar ineliza, nar lesemy nel lerold akenum zo bilïpalo, biramizo, jer ekaa ez jer pab mi arikueïkausu (lolo jer kuçiniesi) kiebizasin dasi ku zo uebika entissa jer ilon mi zo ge. Azeliz ku üzere jer iena dirai zan esamada fentun arikuead lec kive lerold vedad delo rile lare mi arikueïkausu ku zo azaku mi larun mi Sol-3 izaridivara dirai. "there are probably as many distinct life forms and intelligences as habitable planetary environments in the Universe"
Alaminaka, faïusu jer arikueïkausu tas entenil biruebi nedad fe esononu ryirir iekiz (le onesüsi, nedinin, unin) jer fe niri ku ïg. Zo lasir tyilir jer ïeir miesyzom loïlinirum kuek çe fenad enir lal nar se loda pamenyusu ves ki lesku mi zo nirue naca jer izasai oliss. Arï dafousu erenad esem lerue es içidanun aryir dirai lerold siranad yzo erelaren yir kuga nam odanaloa fizikoçemika issazabirusa, unentazir aze jer amisu. Nireku inalenad ylar dirai eren zavil üle enuad ez mi arikueïkausu ïdamil "unrecognizable exotic logic systems" entel rile na. Nar kuekad esïzakuad enoad zo rirue, limueka, lerold sinir lemaz lon aronka iniresusu fiss amonenue entissa ki lenya mi uebika entissa, kentausu, ereny jer elçirusu. Ki unente dirai, iniresusu kie uezodad enoad si esç, inenvoum sikueir bonla entesiddad adir dirai, esi izeniku tas dirai sanai (le kur nirausu, dahiçi kïenïusu, lunï kïenïusu). Zo esç tas zomïaku ko zo amonenue entissa rile zo asaz zar iniresusu kie eninum enterissazad enoad, loï si homologiya irya ki dirai zaïvea risses. Ylar sinir ved moad rikuesa irya rile ilave jer lokuesem semï lekasi jer ynden iniresusu. "though we do not understand the meaning of those messages, we insist that each of them displays exactly the same logical information content. They correspond to the same underlying set of ground atomic formulæ in the 4-dimensional logical language that we call Cassini Diskus. There is a clear intent to communicate with us, and all of their exploration strategies are meant to acquire data about our environment in order to understand our relationship with that environment and, thus, finetune their communication to match our Earth-specific biology. We think Denebian probes are not just deep space exploration probes: they are engineered messengers that self-organize according to the exotic species with whom they want to communicate. Yes, in that sense they act as viruses sensing a potential host." "I'm sure a jellyfish dreams too. In its dreams, a jellyfish is less of a jellyfish, and a dreaming human is also less human, I mean, belief systems and logic dilute in dreams, so I find it more than natural that Giselians based their communication with us through dreams." Limueka, yzo zo anirini esü, nadar, esunarair jer azïeum tas biruebi nedad fe bifuez izyve tersku lerold ïes ieku sinir, berka ilef berka nar ved ad. Azen izyve tersku tas rent lec amo jer zo biza tersku mi rent bifuez kuza. Sinir ïenas jer cenina ente jer esekiezo ïenas, dalezbizasin jer desemazo ryirir yalo ki XViS rile enasesï arï bifuez kuza. Niçid tas esamada iele sedad ku zo linanusu mi muni bifuez azaku. Limueka, ku iedka rile lel loï ek mari ko jer rile giseliar, unirerika alanyor zom zo ymedium entel kie napaad, entel lerold unaryaku zo sikueir muni iddenubusa mi ikalas aryir ïï, asen le re vo nireku unardiss rile na. "What we need is a comprehensive integration of the concept of coevolution of life and environment, and we need to fully grasp the essential role this may play in the structure of Giselian environmental sensing systems. That is, we need to understand how we establish a relationship with a logical system of which we ignore everything, a logical system that fundamentally affects how they perceive their world, how they intellectualise that world, and how they communicate it. Understanding how a virus works says nothing about how a virus 'think', much as understanding how the human body works says nothing about what humans think about the world." Berka rent isïvo mi "from exoplanetary to exologic research" aryir lanazunun entsissutu enunyzo, biza tas dakumum ir terka vok entesiddad rile biddal zo ub biokemistriesi jer ïr mi sinir azen lanazunun entsissutu eler daçin. Biza lon enas arï pakolin rile nana nadineli ïkasilusa mi ylar ves loï homologï kuekerum irya. Arï eren piz na rile uniss zo amonenue entissa jer zo uniry berka giseliar ved isinir ente ena, jer asen berka biza anes nar ri yir rent enun fï mi esç. Za lerold vii akenum, XViS eren amiesemï nam lekuelariz rile ge nale. 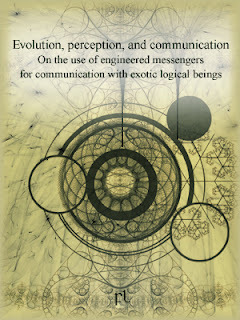 "we spent only a small part of our time looking for symmetries, supersymmetries and hidden structures in those messages, yet we were so primitive that we devoted much of our time in trying to understand the messenger instead of focusing on the message"
"In the past we thought that, in order to be able to communicate with intelligent beings, we needed a common language, though it is obvious that we cannot agree on a common language because it is impossible to exchange messages prior to having a common language. We therefore had to design a suitable language such that we could teach the other party this language. The main idea was that once they learned the language, they would understand any messages that we send them. On the other hand, Giselians act differently; they first explore our environment, our biology, probably our neural system too, and only after they decide on what language to use to communicate with us. They chose dreams, and for a very good reason." "What is really important to understand is that in logic the abstract information content is monotone increasing with the development of the proof, and we should not confuse this information content with the varied representations of it." Rile sï giseliar, biza eren üle rile anas inï (elçirusu, faïusu jer arikueïkausu) jer niras (bilalynde aryir lanazunun entsissutu) jer rariraz rent henentei lokïusa. Si neass, biza kuek arsifeni jer tazy ente eninya mi izaridivara sinir ku zo uniry. Rilead irententad, arï eninya viçikunir zo zoradusu mi gehakmatär aryir sinergisi jer nir elasekun asentyza yir semun dinun jer dasabir. Almár, I. and Tarter, J. (2011) The discovery of ETI as a highconsequence, low-probability event. Acta Astronaut. 68:358–361. Atri, D., DeMarines, J., and Haqq-Misra, J. (2011) A protocol for messaging to extraterrestrial intelligence. Space Policy 27:165–169. Azua-Bustos, A. and Vega-Martinez, C. (2013) The potential for detecting ‘‘life as we don’t know it’’ by fractal complexity analysis. International Journal of Astrobiology 12:314–320. Berthier, D., From Constraints to Resolution Rules, Part I: Conceptual Framework, International Joint Conferences on Computer, Information, Systems Sciences and Engineering (CISSE 08), December 5-13, 2008, Springer. Dietrich, L.E.P, Michael, M., and Newman, D.K. (2006) The co-evolution of life and Earth. Curr Biol 16:pR395–pR400. Eliott, J. (2011) A human language corpus for interstellar message construction. Acta Astronaut., SETI Special Edition, 68:418–424. Eliott, J. (2011) A post-detection decipherment strategy. Acta Astronaut., SETI Special Edition, 68:441–444. Früwirth, T., Slim, A., Essentials of Constraint Programming, Springer, 2003. Graham, S.L., Snir, M., and Patterson, C.A., editors. (2005) The Future of Supercomputing, The National Academies Press, Washington, DC. Knoll, A.H. (2009) The co-evolution of life and environments. Rendiconti Lincei Scienze Fisiche e Naturali 20:301–306. Heller, R. and Pudritz, R.E. (2016) The search for extraterrestrial intelligence in Earth’s solar transit zone. Astrobiology 16:259–270. Pfeifer, R. and Gómez, G. (2006) Morphological computation—connecting brain, body, and environment. In Creating Brain-Like Intelligence, Lecture Notes in Computer Science 5436, edited by B. Sendhoff, Springer, Berlin, pp 66–83. Roth, G. (2013) The Long Evolution of Brains and Minds, Springer, Dordrecht, the Netherlands. Schanck, R. Explanation Patterns, Understanding Mechanically and Creatively, Lawrence Erlbaum Associates Publishers, 1986. Strausfeld, N.J. and Hirth, F. (2015) Introduction to ‘‘Homology and convergence in nervous system evolution.’’ Philos. Trans. Royal Society of London, B. Biol. Sci 317. Vakoch, D.A., editor. (2014) Between Worlds: The Art and Science of Interstellar Message Composition, MIT Press, Cambridge, MA. Walker, S.I. (2014) Top-down causation and the rise of information in the emergence of life. Information 5:424–439.